Sepsis is a major public health problem and the focus of national quality measures and performance improvement initiatives. Understanding what is happening with sepsis rates and outcomes is thus an area of great importance. However, tracking sepsis rates and outcomes is challenging because it is a heterogeneous syndrome without a definitive “gold standard” test. 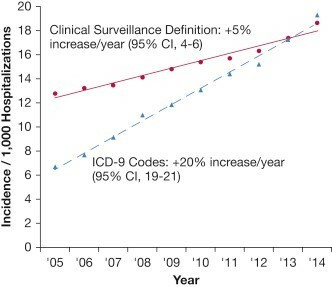 In the February issue of CHEST, investigators compared the effectiveness of claims-based surveillance using ICD-9 codes with clinical-based data and specific diagnostic parameters. Their findings suggest that surveillance based on clinical criteria is a more reliable way to track cases of septic shock. “Our results underscore the challenges in tracking sepsis and septic shock using diagnosis billing codes, which is the current method typically used for epidemiologic studies as well as quality measures. We show, however, that an alternative surveillance method using clinical data is feasible and may provide more reliable estimates of trends over time,” explained co-lead investigator Chanu Rhee, MD, MPH, Department of Population Medicine, Harvard Medical School/Harvard Pilgrim Health Care Institute and Division of Infectious Diseases, Brigham and Women’s Hospital, Boston, MA. Annual septic shock incidence trends at 27 U.S. academic medical centers using the clinical surveillance definition versus ICD-9 codes, 2005-2014. Investigators also observed that other factors may influence the statistics about septic shock mortality. As more patients opt to leave the hospital setting for end-of-life care at a hospice, the number of hospital deaths from septic shock is declining. “Not accounting for this evolving societal preference can exaggerate the overall impression of improving outcomes,” noted Dr. Rhee. The article is “Estimating Ten-Year Trends in Septic Shock Incidence and Mortality in United States Academic Medical Centers Using Clinical Data,” by Sameer S. Kadri, MD, MS; Chanu Rhee, MD, MPH; Jeffrey R. Strich, MD; Megan K. Morales, MD; Samuel Hohmann, PhD; Jonathan Menchaca, BA; Anthony F. Suffredini, MD; Robert L. Danner, MD; and Michael Klompas, MD, MPH (http://dx.doi.org/10.1016/j.chest.2016.07.010) published in CHEST, volume 151, issue 2 (February 2017) by Elsevier.